Many different types and species of birds call the Illinois wetlands home, from the small to the tall. Some species live in the state year-round, although Illinois wetlands are more commonly inhabited by migratory bird species that stop along their route or use the wetlands as a breeding ground. Many of the wetlands' native birds are endangered or threatened, largely due to habitat loss in Illinois. Several conservation efforts are trying to preserve and restore the state's wetlands. Most of the wading birds that frequent Illinois wetlands are in the heron family and include little blue herons, great blue herons, yellow-crowned night herons and black-crowned night herons. Of these herons, the great blue heron is the largest and among the only waders that call Illinois home during the winter. 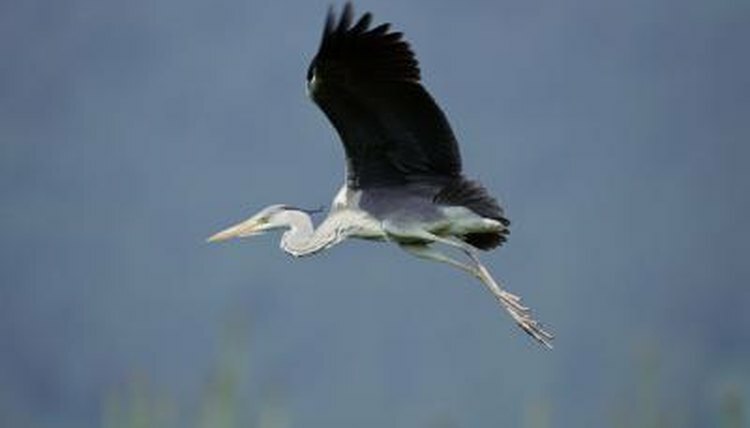 The yellow- and black-crowned night herons are short, stocky herons; the little blue heron is deep, slate blue in appearance. Egrets are members of the heron family and as such closely resemble them. The snowy and great egret are both pure white, long-legged birds, although the great egret is taller than the snowy. Another difference in the appearance of the two is the bill color: the great egret's bill is yellowish while the snowy's is black. Each has black legs, but the snowy egret has bright yellow feet. The cattle egret is another inhabitant of Illinois, although it's typically more fond of pastures than wetlands. Both the blue-winged and green-winged teals make stops in Illinois on their migration to warmer areas of North, Central and South America or use wetlands in the southern half of the state as breeding grounds. These ducks are much smaller than the common mallard, but vividly colored. The bright wood duck is a year-round inhabitant of Illinois swamps and marshes, or other areas with thick cattails. These boxy ducks nest in trees. The small pied-billed grebe is an interesting waterbird with a small, chickenlike beak. Pied-billed grebes breed in Illinois during the summer; the southernmost portion of the state is part of this species' year-round range. Several other birds make their homes among the waters of Illinois wetlands, whether in low brush or along the reeds and cattails. Yellow-headed blackbirds, least bitterns and red-winged blackbirds are frequent visitors or inhabitants, eagerly catching insects or picking seeds. The common yellowthroat warbler sings its song while sitting near the ground. Sedge wrens and swamp sparrows also buzz about Illinois wetlands, while the sora stays along the ground searching for food. What States Do Screech Owls Live In? Where & When Do Quails Nest?